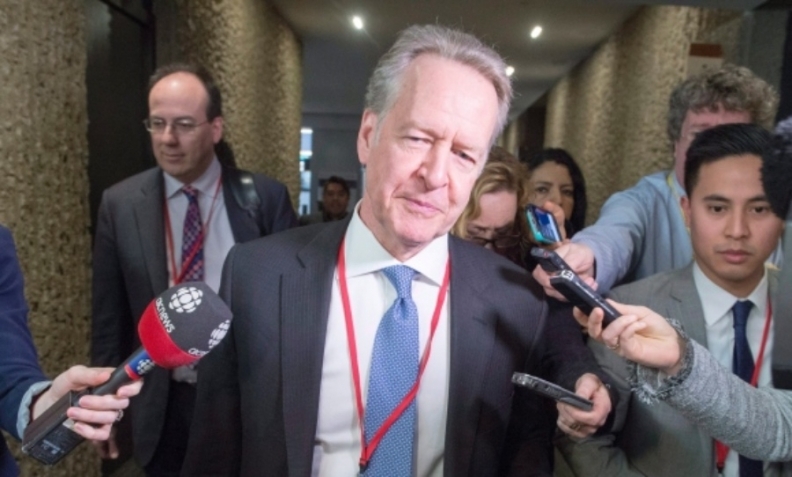 Canada's chief NAFTA negotiator Steve Verheul speaks to the media as he leaves for the lunch break at the sixth round of the North American Free Trade Agreement Thursday in Montreal. The United States has taken Canada's proposals back to their politicians. MONTREAL — Important decisions about NAFTA's future are now in the hands of the Trump administration, as American negotiators turn to their political masters for guidance with a potentially pivotal round of talks set to conclude on Monday. After major discussions about autos, dispute resolution and a five-year review clause, which some hailed as the first signs of true bargaining on difficult issues, American negotiators have asked political decision-makers how to respond. There could be more clarity soon. The politicians leading the process for all three countries will be in Montreal to close the round, hold meetings, and make public statements Monday. This follows a round that featured hours of back-and-forth dialogue on autos and other major sticking points. The Americans "engage, they listen ... They take [these ideas] and they say, 'We have to look at them in further detail and seek political guidance,"' according to one official with close knowledge of the talks. "It was not ... 'Thank you for your proposal, I'm leaving.' Let's just say we spoke about the [auto] issue twice, for about an hour and a half each time. So this is the type of engagement we're having, which I think is positive. It hadn't happened before." The round represented a new phase of the negotiations. Earlier rounds had seen scant engagement on the most serious files — with the United States dropping proposals that shocked the other countries, and the other countries insulting the American ideas and devoting one round to describing reasons their proposal on cars was so impractical. This round was an early example of countries seeking a pathway to solutions for more difficult problems — and the talks didn't collapse. "Solution mode," is how Canada's trade minister, Francois-Philippe Champagne, described the round Sunday. "It seems that our proposals were looked at by the other parties. That's what we hoped for." On autos, the Canadians suggested new ways to calculate whether a car counts as American. The new formulas being proposed would inflate U.S. numbers somewhat by including areas where the U.S. dominates, such as intellectual property and research. On dispute resolution, the Canadians and Mexicans threatened to sideline the Americans from the investor-state dispute system. The United States has suggested it might want to opt out, arguing it provides assurance for investors outsourcing operations to Mexico. A Canadian counter-proposal, developed with Mexico, would prevent the United States from participating in or developing rules for the new system: "We basically said to them, 'If you want to opt out, that's fine — you're gone,"' said one non-American. "You can imagine that the U.S. negotiators didn't like it." On the review clause, the United States has proposed a rule that would terminate NAFTA every five years unless it's maintained by all three countries. Mexico responded a few months ago by proposing a watered-down version, which would force countries to periodically review the effects of the agreement — but drop the automatic-termination rule. Canada has signed on to the Mexican approach, and proposed ways it might work. One involves tasking NAFTA's central body, the Free Trade Commission, with conducting regular progress reports. People close to the talks added notes of caution. No difficult issues have been settled, the serious engagement has just begun, and it's still unclear what might happen after March, when the currently scheduled talks conclude. Yet several people said this round had sparked some new optimism. A chapter on anti-corruption was closed, chapters on digital trade and telecommunications are more than 90 per cent done, and there's new engagement on some hard files, one official said. "I believe that we saw some interesting things," said the non-American. Negotiators also continued to discuss a more progressive trade agenda this week, which includes raising labour standards, but there appeared to be little if any progress. Democrats in the U.S. are expressing frustration the issue hasn't gained more prominence. And Francois Laporte, president of Teamsters Canada, told a gathering Saturday that his Mexican counterparts face tremendous challenges to organizing rights. "It is the responsibility of the Canadian government and the U.S. government to incorporate in the new NAFTA agreement — NAFTA 2.0 — labour standards provisions, environmental provisions," he said. "If we don't get this, we will never be able to fix NAFTA." The round also avoided one of Canada's most bedevilling, politically fraught sticking points: dairy. American milk producers are demanding greater access to Canada's supply-managed system, and the issue is certain to come up in later rounds. "We really want market access," said Jaime Castaneda, vice-president of the U.S. National Milk Producers Federation. "My goal has always been to have a true, free trade in North America for dairy," he said. "We have been consistent and we will remain consistent. We will keep what's good in NAFTA, and we will fix what's broken. And the broken part is obviously the Canadian side."